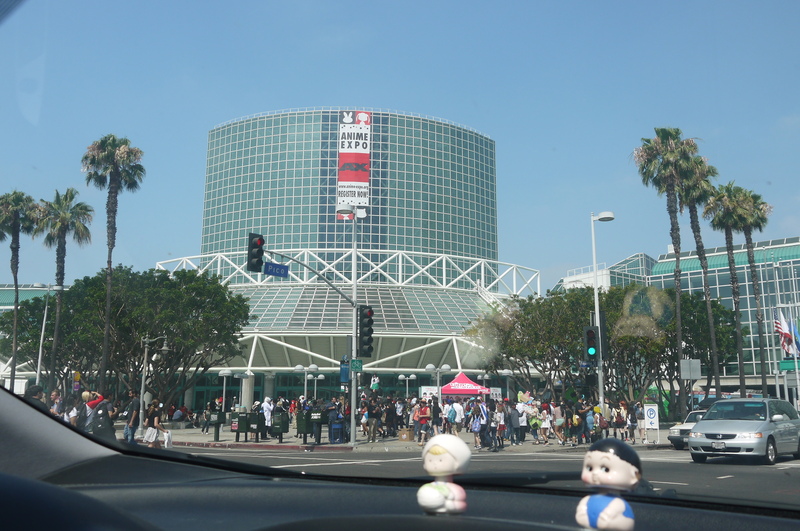 Last day of Anime Expo. We won’t be going the fourth day since there really isn’t much to be done. To be fair, we’ve really had our fill with the last three days. 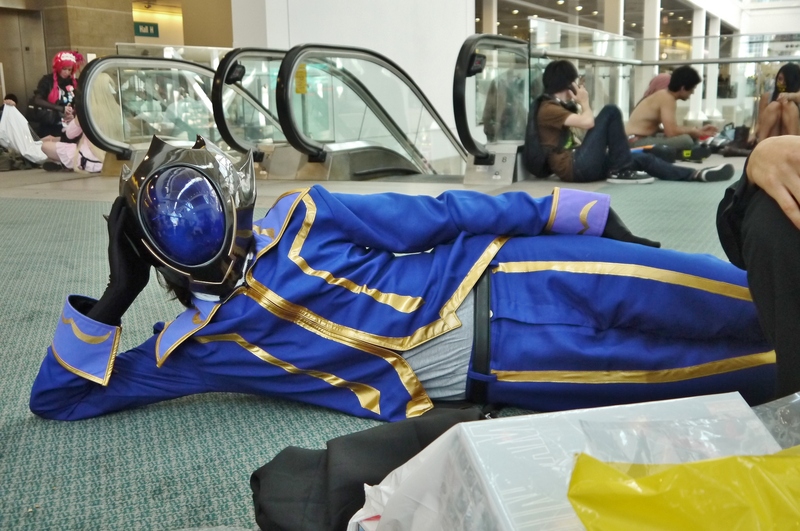 Merch was bought, pictures taken, cosplays oogled. Best year yet. Saturday seemed to be the most crowded day. 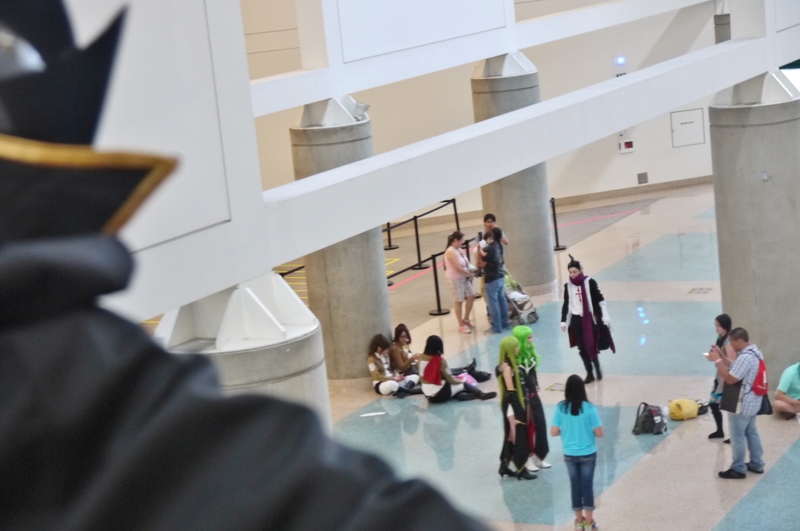 There was actually a line for badge pick-up today, unlike yesterday during Day 2. 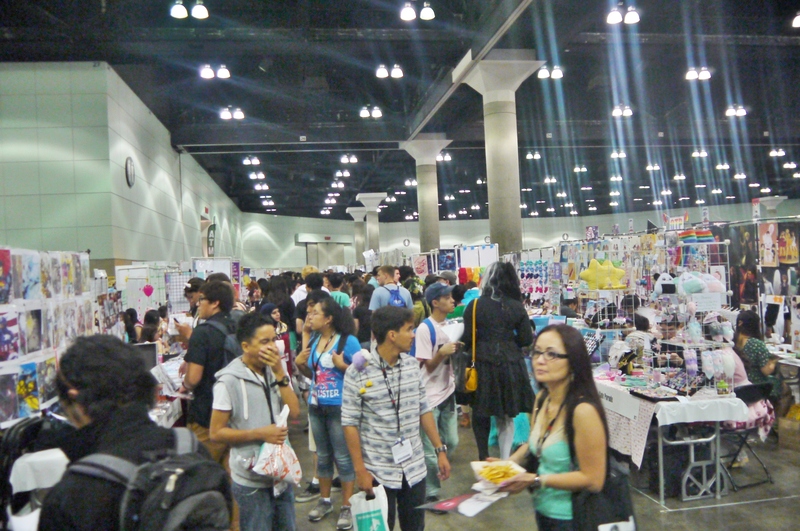 The Exhibit Hall in particular was pretty congested. Seems like more people attend every year. My cameraman buddy went around and took quite a few shots of figures and statues and the like this time, rather than so much Gunpla. 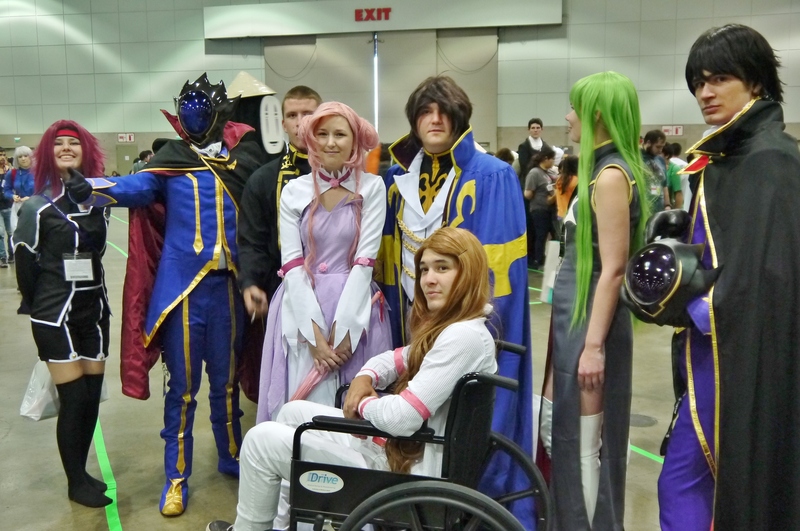 And as always, plenty of cool cosplays all around. The sheer amount of people here today meant just that much more good stuff to oogle and gawk at. 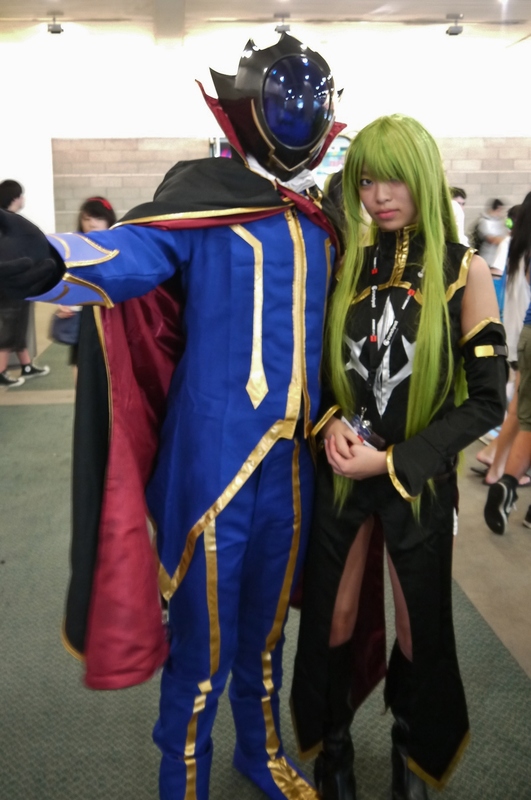 These guys had a pretty amazing Code Geass set up going on here; it’s always awkward when you encounter someone with the same costume as you and there ensues the battle of cosplays between who’s is better. That guy’s Nunally though. Absolutely majestic. A skilled wheelchair artist he was. Took plenty of photos together with others as usual today, though halfway through I began to get a little sick of it. I never thought I’d be able to get sick of the constant ego-stroking when people asked for my picture, but eventually I got just a little too claustrophobic inside the mask all day. 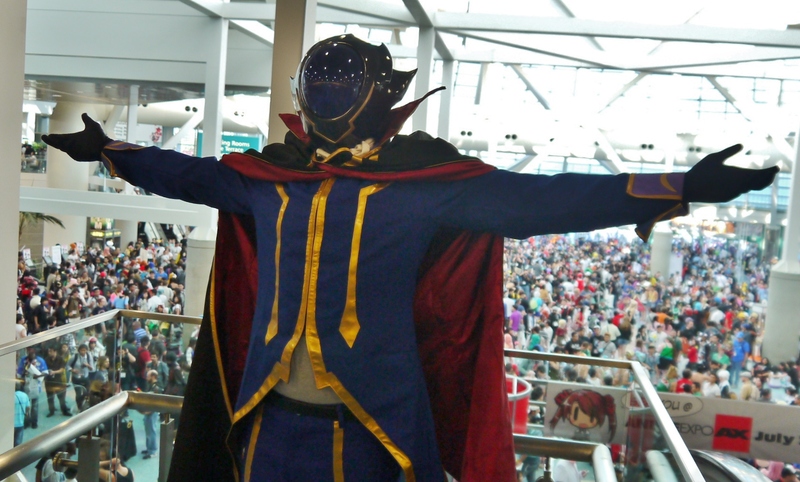 Really put this costume through the grinder with the past three days non-stop at the convention, in that thing all day. I mean, not gonna lie, I felt like a badass with the mask on, but the outfit can only take so much. 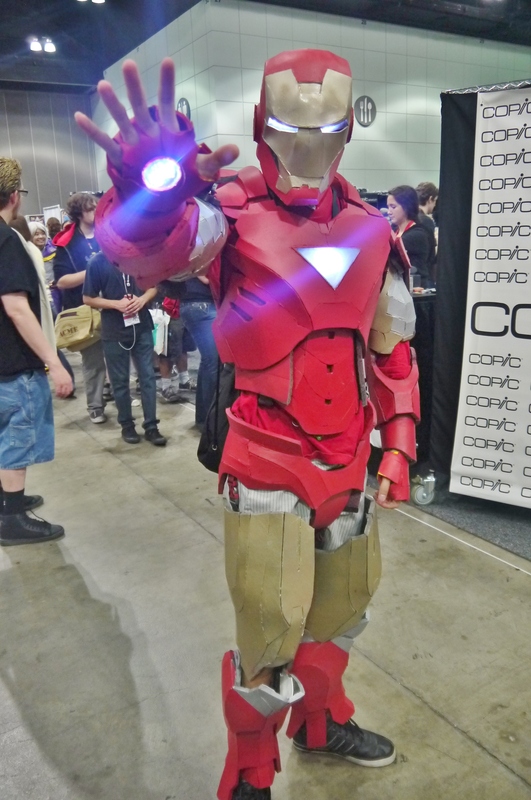 Met another Iron Man, a Mark VI this time. It was pretty legit, with the light-up helmet, and my colleague and I noticed that he used clip-in buckles to hold some of his armor together, which was an inspiration for us, should we attempt another Operation: Virtue next year. Bunny suit Haruhi all the way! My comrade also made quite a few rounds throughout Artist Alley today, picking up artwork left and right. It’s never been my thing, particularly, but some of the pictures were pretty cool. I personally prefer physical 3D objects to 2D images. 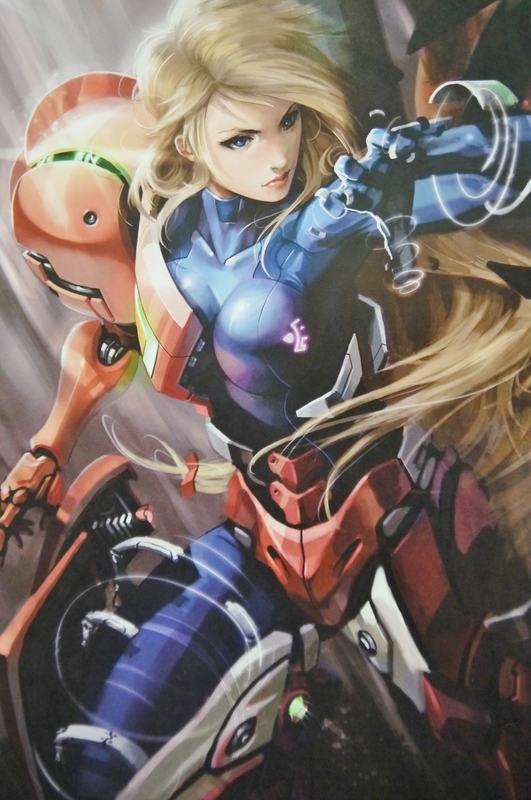 This Samus drawing though…man, if I had a chance, I would’ve definitely picked that up. It was beautiful beyond what words could describe. Unfortunately my friend could only take a picture and show me later. All the crazy figures on display that we saw. They just scream for me to throw money at them, but my wallet just cries in response as it burns in the permanent hellfire that is animu figurines. 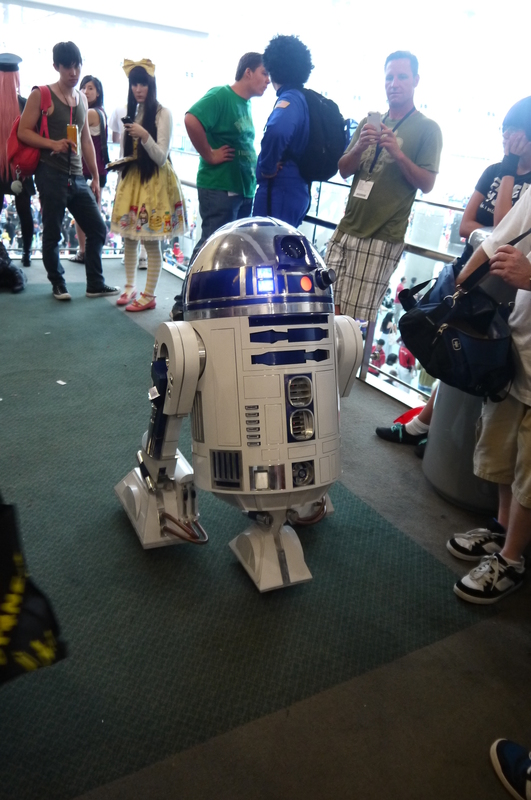 Bleep bloop blop, coming through~! 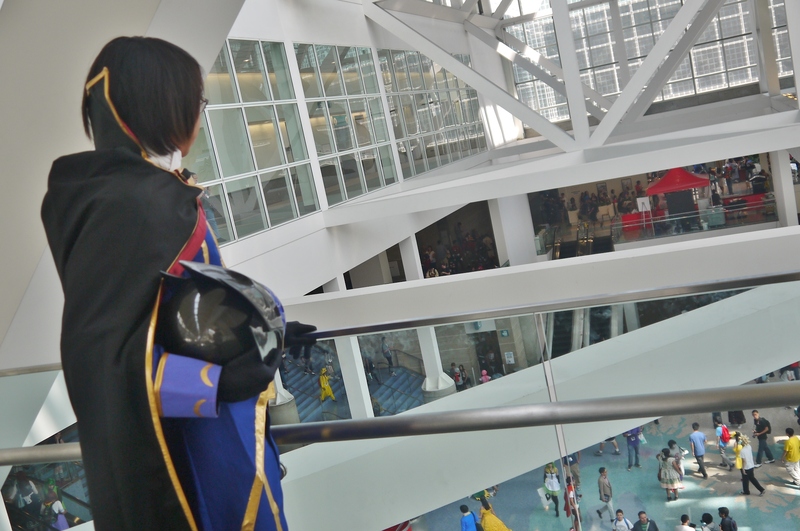 Overlooking the peasants below. 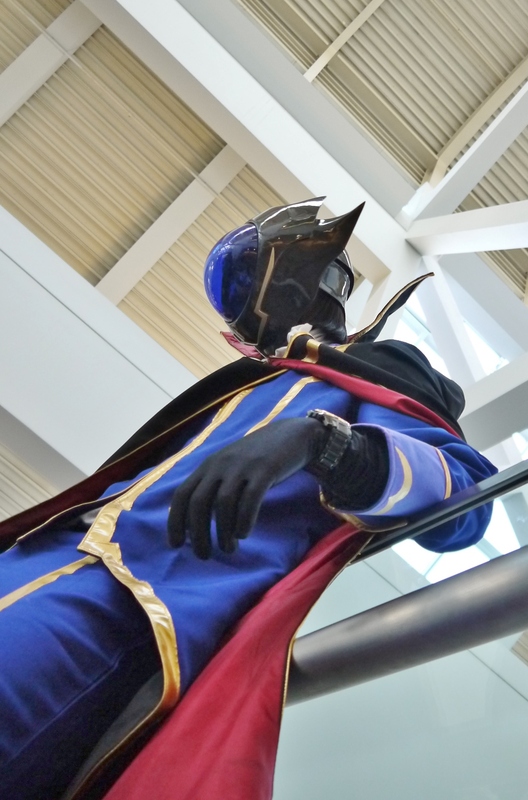 I was scared as feth to drop my mask over the railing. Not because it would likely leave a massive bruise on some poor soul’s skull below, but because it might scratch the finish. Today was buying day for most of us, especially for my comrade, since he didn’t have his clunky Gundam armor to deal with. He went ahead and picked up his first Master Grade kits, the Freedom, AGE-1, and Wing Zero Custom. Found many more C.C.’s today as well. Overlooking the balcony, two objectives sighted. Commence operation: double trouble. …AND IT SHALL BE CALLED, THE UNITED STATES OF JAPAN!! Our combined loot at the end of the day. Between all of us, we really went crazy and just threw money everywhere. 100% worth though. I’m satisfied, and I think a lot of my comrades were too. I stuck with my original plan and picked up mostly ‘pla. 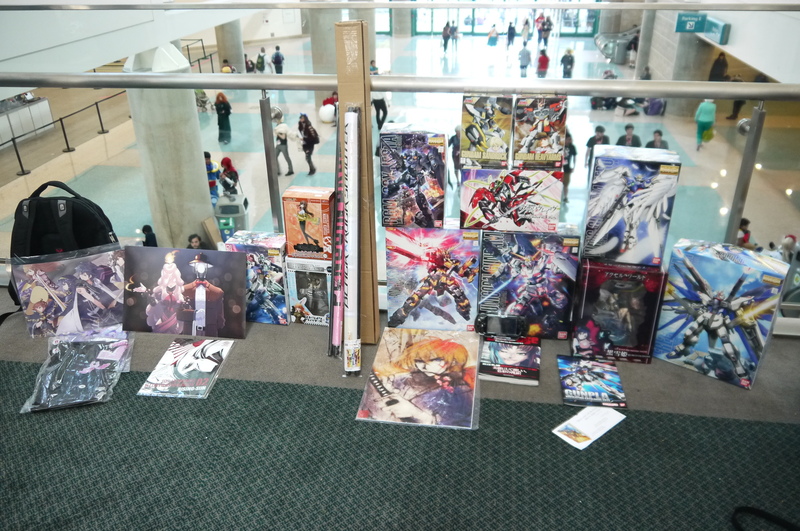 I find that most things I buy from AX in previous years that aren’t ‘pla, I end up selling and getting rid of eventually. That Composite Ver. Ka. Shinkiro was bought from an AX in previous years, and is now packed back up and ready to be resold. 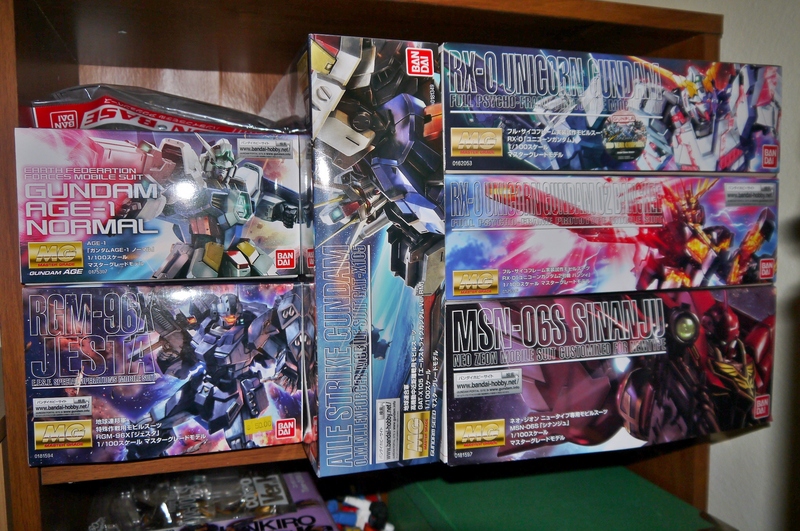 As a side effect though, my backlog is now stupidly full, with all the kits shown above. That’ll last me a good year, I swear. 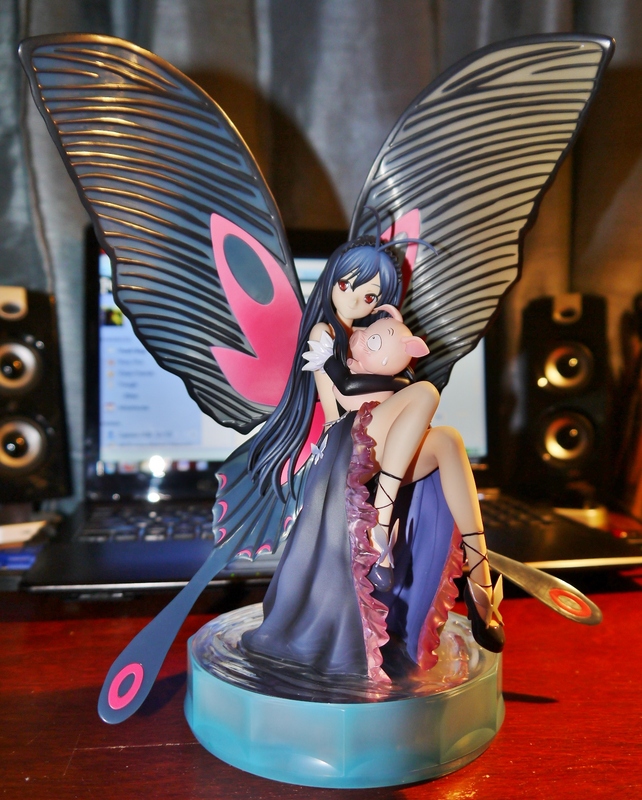 The highlight for me, however, was this highly coveted figure that I’ve had my eyes on for a while…I’m a huge Accel World fan (as can be evidenced by the Figma collection) and I was honestly surprised at the amount of Kuroyukihime statues and figures at the ‘con. I had no idea they even made that many. Naturally though, I had to go for the most beautiful, high quality one around. And that just so happened to be the Good Smile Company 1/8 statue. It’s absolutely gorgeous, and every penny was well spent. 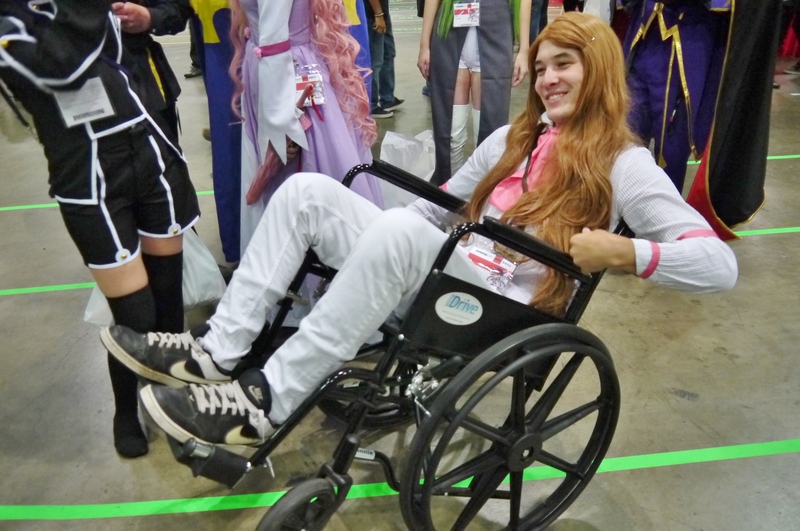 By the third day of the ‘con, most vendors were putting her up for roughly $130 each. However, due to an old connection from a vendor that I shopped with last year, I manged to snag her for $90. It was a pretty square deal, and am very pleased with the result. United we stand, the gentleman’s club. One Zero to rule them all. 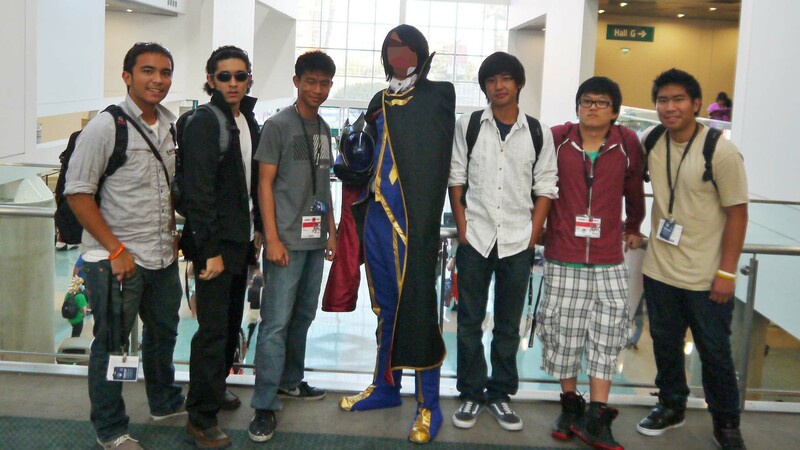 Overall Anime Expo was a well-worth experience. Just about everything I had hoped for it to be, and then some. 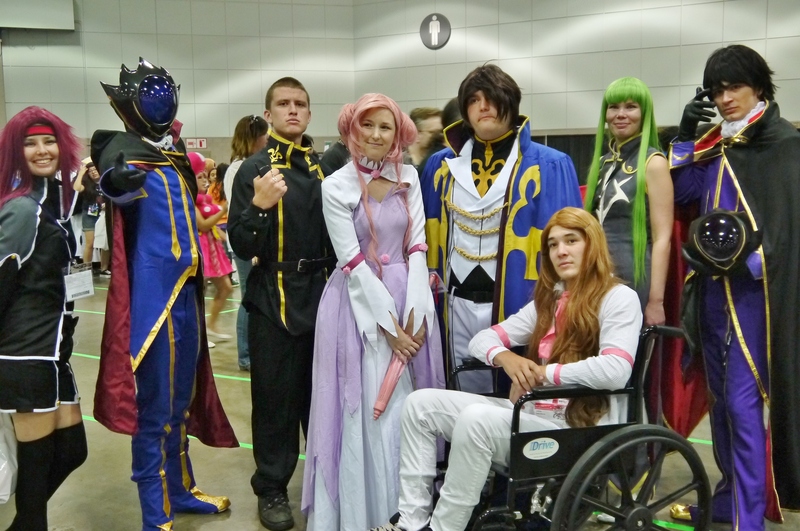 The success of Operation Virtue was likely the biggest accomplishment, but it was also a first for me to have such a successful cosplay attempt, as well as attend for more than one day. I’d recommend anyone capable to come down to LA and attend this annual event, it’s well worth all the hours waiting in line and every penny you pay for your ticket.